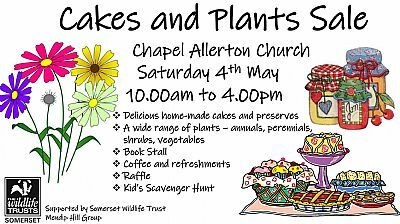 Drop in to browse the stalls of delicious cakes, biscuits, preserves and other local produce, and the extensive plant sale, including annuals, perennials, shrubs and vegetables (in conjunction with the Somerset Wildlife Trust). Stay for a cup of coffee, try your luck at the raffle, and give the kids a run-out with a mini-scavenger hunt in the safety of the churchyard. Somerset County Council has received an application to divert a footpath and wishes to consult with all interested parties regarding this proposal, details of which are here. The proposed diversion will move the existing paths out of the yard and buildings of Brinscombe Lane End Farm and on to routes which will afford better views and walking conditions. This will mean improved biosecurity for the farm and health and safety for path users. This plan shows the existing and proposed routes and their location. Especially topical at the moment, Sedgemoor, Taunton Deane and West Somerset Councils are taking the opportunity to remind homeowners and landlords of a loan scheme to replace heating systems. The scheme has been developed to keep people warm and cosy in their homes over the winter months. The loan scheme is open to people who heat their homes with gas, oil, Calor gas, LPG, electric or other sources and to those who do not currently have central heating installed. Eligible homeowners can choose their own contractor and there are a variety of loan products available to suit individual needs and means. Wessex Resolutions CIC is a not-for-profit finance provider working in close partnership with the council to deliver the loan scheme. The partnership has been running for over ten years across the district and has helped a huge variety of homeowners, from people simply requiring a new gas boiler to those needing the whole system installed, through to people living in off-gas properties or those that have lived without heating for years because they did not know help was available. If your boiler has packed up; or your current system is inefficient or non-existent, a loan funded by the councils can help spread the cost of a replacement but let you enjoy the benefit right away. Through providing loans, the councils are ensuring that funds for homeowners are sustainable which means that every repayment goes back into the council pot to lend to homeowners into the future. There has been a lot of publicity about the plight of hedgehogs. This decline in one of the country’s favourite animals is thought to be largely due to loss of habitat. This is particularly so in our over-tidy gardens and Warwickshire Wildlife Trust suggests the following simple measures to help this mammal that is truly ‘the gardener’s friend’. Make sure hedgehogs can get into next door’s garden. They need to travel to forage for food and to meet other hedgehogs. If you have a wooden fence cut a small hole near the base, the size of a music CD is an ideal size. Consider leaving a patch of your garden to go wild: long grass with a fallen log or two close to your hedge is ideal hedgehog territory. Build a pile of sticks or offcuts of timber and twigs then cover with leaves in a quiet part of your garden - under a thick hedge or behind the shed is ideal. This will provide somewhere for them to shelter and maybe build a nest. It can also provide a place for winter hibernation. Hedgehog houses can be purchased for this purpose. There are websites that give instructions on how to build your own hedgehog hideaway, from simple ones needing only an old crate or box and plastic covering to a solid wood construction that will last many seasons. One last thought, sadly many hedgehogs die as a result of strimming, try to leave a wild area for them under your hedge. The Parish Council regularly gets complaints regarding hedges and shrubs overhanging the road and pavements. This often narrows the road by two to three feet, causing problems for pedestrians and traffic. The Council asks you to please look at your boundary hedges and, if necessary, cut them back beyond the road or pavement edge. The society is looking for new members to join them. They meet on Thursday evenings during September to May at 7.30pm in the Methodist Church Hall, College Street, Burnham on Sea. The choir is mixed, so men and women are welcome, there are no auditions and the first three weeks are free so there is no pressure to decide on the first night. For more information contact Bev Hearn on 01934 732041 or email Jane Lee. Or visit their Facebook page where there are some video clips of past concerts.